Participants from the United Kingdom may join this tour on 14th June at 09.00 am in Newcastle at arrival of the ferry from IJmuiden. Scotland a scenery which is surprisingly varied country with forests and an almost bare green landscape, but also wide views and thousands of lakes. Shortly said a country in which you may have all seasons in one day. Scotland is a very attractive country because of its seabirds. Every birdwatcher likes to see these species: puffins, guillemot, razorbill, fulmar, kittywake in spectacular colonies, dotterel, ptarmigan, great skua, arctic skua, snow bunting, ring ouzel and merlin. During this birdwatching tour we will explore the surroundings for these species. During this time of the year the chance for better weather circumstances is best and in the month of June we have longer days in Scotland. After arrival in Newcastle we drive along the coastline to Scotland. We will visit a small rock where most of the seabirds are staying. It gives a stunning view to sea attacting the rocks. The birds are imperturbable, their lives go on. It does not matter if it is stormy or not. If you have a closer look at the birds you will see their differences and preferences. The kittywakes breed at ridges along the steep rocs. Their nests are enlarged every year with seaweed, grass and lichen. The guillemots also breed at the ridges. Because they make no nest, they prefer the flat upperside of the pillar rocks. guillemots live very close together and live mostly in harmony. Sometimes they are quarreling, making noise and use their bills to attack and defend. At the end of the day we arrive in our hotel. This hotel is very well situated, at the end of a dead-end road, at the feet of the Cairncorm Mountains, surrounded by nature. Scotland is not bare and wide everywhere. At some places we find the rests of the original Caledonian pine forests, which has been preserved. These remainings are mainly the Scots pine forests. These trees can grow large and tall. These kind of trees are important for the ospreys, which specie makes his nest in the top of the flat crown of the tree. We will visit the famous osprey nest near Loch Garten. Here is a video camera, which is giving a view on the nest, which can be seen in the visitors center. After the overwhelming noise of the seabird colonies, we will enjoy the beneficent silence of the Scotish lakes (lochs) and swampy moors (moors). Here you will find less birds, but some of the species are very special: famous grouse, short-eared owl, hen harrier, merlin, golden plover, dunlin. In the neighbourhood of some lakes we will find lochsred-throated diver and black-throated diver. In the surroudings of little lakes we can see Slavonian grebe. We have a chance to see goldeneye, Red-breasted merganser, osprey, common sandpiper, and sometimes the common scoter. The moors are big swampy heeds, which are formed after cutting of the forests. Curlew, meadow pipit, wheatear, skylark prevail generally. 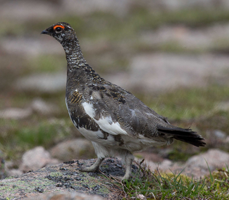 Other species are less numerous such as the black grouse. species are breeding on the island) puffins near their nestholes, a small colony of arctic terns, singing Scandinavian rock pipits, great bak-backed gull and possibly some black guillemots. Most of the birds are rather tame. You could come very near to these birds and make very good pictures. Along the coast there is also a colony of gray seals, resting on the rocks when it is low tide. The Cairncorm mountains are situated in the centre of the Scottish highlands. These very old mountains have been erodated for years by water, wind and ice. At the flat tops of these mountains we have a tundra climate. Here we make a long walk searching to the special species of this area: dotterel, ptarmigan and snow bunting. Glens are deep valleys formed by gletchers in the moutainous areas. Remote valleys with steep rocky wallls are very suitable for a breeding place of the golden eagle. Golden eagles prevail generally in Scotland, though they are not so easy to get an eye on it. In this same area we have a chance to see ring ouzel, twite, dipper, wagtail, wheatear and peregrine. Walking between thousands of seabirds, gullemots, razorbills, kittywakes, shags and puffins. 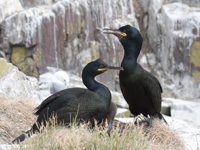 During the forelast day (depends on the weather conditions) we will visit one of the bird islands of the Farne islands. We try to land, where we will walk a small trail between breeding birds. On our way to the island we will see many birds and grey seals as well. During this tour, there will be, depending on the weather circumstances, excellent possibilities for bird photography and not even birds alone. Also gray seal and bottle-nose dolphins can be seen and registered with your camera. 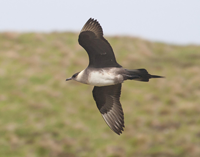 Especially the seabirds and the species of the highlands can be approached very close. The short movie below gives a good impression of this tours possibilities. 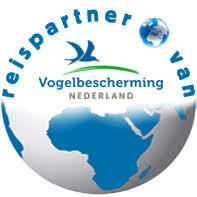 Price: € 1750,- for participants starting the tour in Newcastle on a halfboard basis. Tourcode: 15Schot (please mention when booking). Walking effort: One trail climbing the Carngorm Mountains is rather intensive. The rest is easy going. Number of participants: 6 – 8 persons. Accommodation: good middle class hotels. tour guide: English speaking tourleader. Hieronder de kaart van Schotland met de locaties die worden bezocht. Klik op de rode punten voor meer informatie. -"Ik vond de reis heel fijn. Prachtige waarnemingen en zo relaxed. Ik kijk nog regelmatig terug op een heel fijne vakantie. Fantastisch ook die dolfijnen. " -"Calculeer het „Schotland”-weer en de kleine muggen van te voren in en je zult overrompeld worden door het land, de natuur, de vogels en de mensen."